If you haven’t heard of Spandex, you will definitely have heard of Lycra or elastane and you probably wear it everyday; you don’t have to be head to foot in sportswear to be wearing spandex. All three names are used to describe the same fabric; spandex is the generic name for elastane fibre in North America, but in the UK and Europe, DuPont’s brand name for their elastane fibre – Lycra is more commonly used. I don’t know where the word Lycra comes from, but according to Wikipedia, Spandex is just an anagram of the word “expands”. I like that!! This remarkably elastic and widespread fibre is completely synthetic; a derivative of oil and was first invented in 1959 by an American textile chemist called Joseph Shivers while he was working at DuPont on a project to develop a synthetic replacement for rubber. Its impressive ability to stretch and recover makes it perfect for close-fitting garments and clothing worn by athletes. Until the invention of spandex, natural rubber was used in elastic and added to textiles to make them stretch but crucially, rubber is damaged by sunlight, oils and sweat and it also gradually reduces in elasticity and strength over time. WHY IS SPANDEX USED IN FABRICS? and socks that stay up! home textiles such as curtains, cushions, throws and carpets. Spandex is never used on its own and can be blended with other natural and man-made fibres and this is probably what has helped its incorporation into so many of the textiles we wear and use today. and when I searched “spandex” another 68 products came up – exclusively underwear and hosiery, that’s a total of 139 products. Interestingly when I did the same on the Zara website, searches for lycra and spandex brought back nothing, but a search for “elastane” brought up a total of 2670 items across every department. HOW TO CHOOSE THE RIGHT SPANDEX CONTENT? 20%+ will be best for high performance sportswear and swimwear. HOW TO PROLONG THE LIFE OF YOUR SPANDEX GARMENTS? Wash on a gentle cycle. and here are my secret weapons – I add soda crystals to my regular detergent liquid and use distilled white vinegar in the fabric conditioner drawer, the added bonus being that these products also keep your washing machine clean, soften water, reduce limescale and are a lot cheaper than the specialist detergents you can buy for washing sportswear – white vinegar is around £1 a bottle, soda crystals are around £1.20 a bag. My secret spandex laundry weapons! Then air dry indoors on an airer or outside on the line, never using a direct heat source (ie. on a radiator or in a tumble drier) as it can damage the elastane fibres. 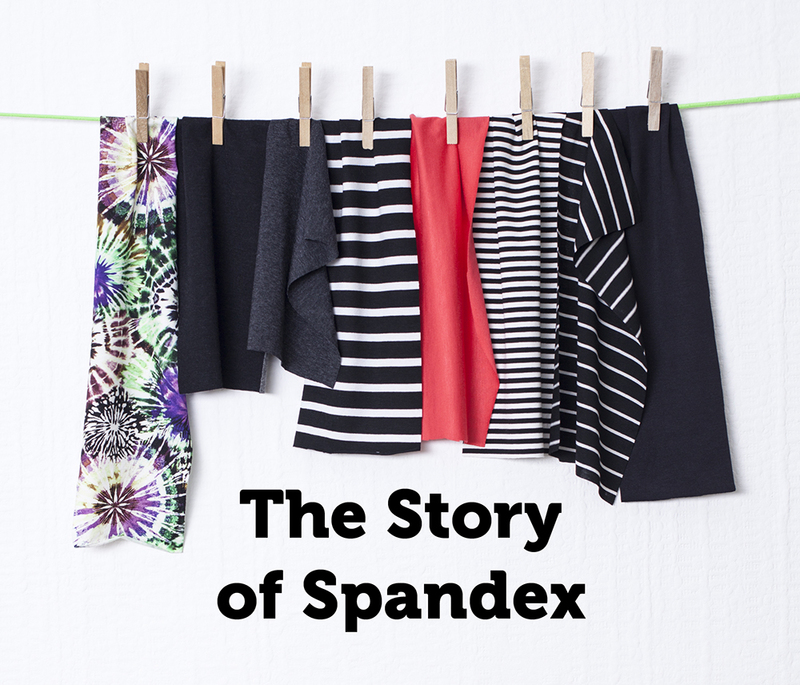 WHAT IS THE ENVIRONMENTAL IMPACT OF SPANDEX? As spandex is derived from oil and essentially a type of plastic, current environmental concerns over plastic pollution might also be relevant to spandex (although less so than fabrics like fleece which tend to shed more fibres). There is growing evidence that when we wash our clothes they shed tiny particles (microfibers) of synthetic fibres that are small enough to by-pass the filters not only in our washing machines, but also in our sewer systems, ultimately finding their way into our rivers and seas. There are growing concerns that this might also happen with elastane. Seamwork https://www.seamwork.com and Closet Case https://closetcasepatterns.com have a few swimwear patterns. There are patterns for t-shirts, tank tops, lounge pants and more in my book Beginner’s Guide to Sewing With Knitted Fabrics. This entry was posted in Fabric, Sewing Help, Writing for Magazines and tagged activewear fabric, elastane content, environmental impact elastane, environmental impact lycra, environmental impact of fashion, environmental impact spandex, how to wash elastane, how to wash lycra, how to wash spandex, laundry tips, lycra content, spandex vs lycra, sportswear fabric, Wendy Ward, what is elastane, what is lycra, what is spandex. Bookmark the permalink. What alternatives do those of us have who don’t want to add particles of no value to the environment each time we wash clothing? A great question….I guess the only way is to choose fabrics that are natural fibre and spandex blends rather than synthetic and spandex. Natural fibre versions tend not to have very high spandex contents though, so wouldn’t be great for sports/performance garments. I really enjoyed reading this post. Found it so informative. Cannot wait to read more about other fabric types!